When I was in middle school, just as flip phones were beginning to populate the fake Dooney & Bourke clutches and cargo shorts of my classmates, many students would download ringtones that were supposedly too high pitched for adults to hear so that they could receive notifications throughout the day without getting in trouble with their teachers. To be honest, I never heard the ringtones go off either because they didn't really work or because I was born with a 40-year-old's hearing ability, but just the idea that they existed created a feeling of virtual community — a reassuring idea that there was a signal only people my age could access. If I were asked to think of the equivalent now, a sound that, when played, is immediately identifiable to a group of people who grew up in the mid-2000s, it might just be the opening verse of Jesse McCartney's breakout hit, "Beautiful Soul." The lyrics are drilled into the part of our brains that has meticulously memorized lyrics to every song we listened to when carpooling to band practice or locking eyes with a crush at a dance. Now, when the song is played at a house party, McCartney needs to only get through "I don't want another pretty face," before the whole room sings back, "I don't want just anyone to hold" — a nostalgic call-and-response. As a tween, it felt like he was singing to me, that his high-drama lyrics and sugary pop hooks created a space where my teen girl romance fantasies could unfurl completely unquestioned. Today, McCartney is 30 years old and back after a 4-year hiatus since his 2014 album, In Technicolor, with a new single, "Better With You," that again taps into an uninhibited daydream of romantic euphoria. The music video depicts a meet-cute in which a girl drops her purse and a quarter falls out of it, hitting McCartney's shoe and causing him to run after her. The entire trajectory of their love plays out on the screen like a Nicolas Sparks film, relaying the message that even the tiniest events can have a dramatic impact on our lives, so it's important to take them all seriously. Because there is nothing more captivating than the ups and downs of romantic love. When talking to Jesse McCartney over-the-phone, it's clear that his music's heavy emotional pull is intentional and that he thinks carefully about tapping into the sounds and emotions that have attracted his fans from the beginning. "A song is supposed to do what a movie is supposed to do," he says. "It's supposed to make you laugh, it's supposed to make you cry. It's supposed to pull you in and draw parallels to your own life. This record might be able to do that more than others because lyrically you can sink your teeth into it. It's saying a lot more than maybe some of my past records. Musically, it's most reminiscent of my earlier songs from Beautiful Soul with contemporary production and lyrics. I think it has a nostalgic sound." After releasing In Technicolor, McCartney took a break from his life in the spotlight, which he had occupied since he was 12 years old. He got into cooking barbecue, watching wildlife documentaries, and traveling with his girlfriend, excited to, "see a country without having to worry about working in it, not seeing anything but the hotel room and radio stations... [or] being looked at or judged." While he enjoyed sharpening his non-music related skills, McCartney couldn't stay away from pop music for too long. The catalyst for his return was, unexpectedly, a country songwriting camp he attended that was run by his friend and collaborator Shane Stevens. Stevens invited dozens of songwriters to Nashville for a few weeks and write songs with a new group of people every day. At the end of two weeks there, McCartney left with 14 new country songs and a renewed interest in returning to the studio. Since his 2014 release, the music world has changed tremendously. Streaming has garnered momentum, the political climate has taken a sharp turn with Trump's election, and social media has evolved. McCartney has chosen to release his upcoming project independently, a decision he feels is personally empowering and feasible for the current social media-driven music landscape. He tells me that apps like Instagram and Twitter allow him to reach fans more directly and to eschew labels who might hinder his creative process. "You can really get the music to your fans pretty directly using of social media," he says. "You can do what you want in a safe space without having to be criticized or without someone looking over your shoulder. In today's world of sharing, it's really important that you don't have to jump through hoops and wait five months on a song before you can release it. It allows me to be closer to my fans. It's a really liberating feeling knowing I can call my own shots." The turbulent political climate has also influenced McCartney. While he is writing music that plays on his original sounds and lyrical themes, he also feels that he's writing for 2018, telling me that a song is only as good as its timing. When he sat down to pen the tracks on his upcoming project, he felt like he needed to write something positive to give people a break from the daily anxieties fueled by the news. 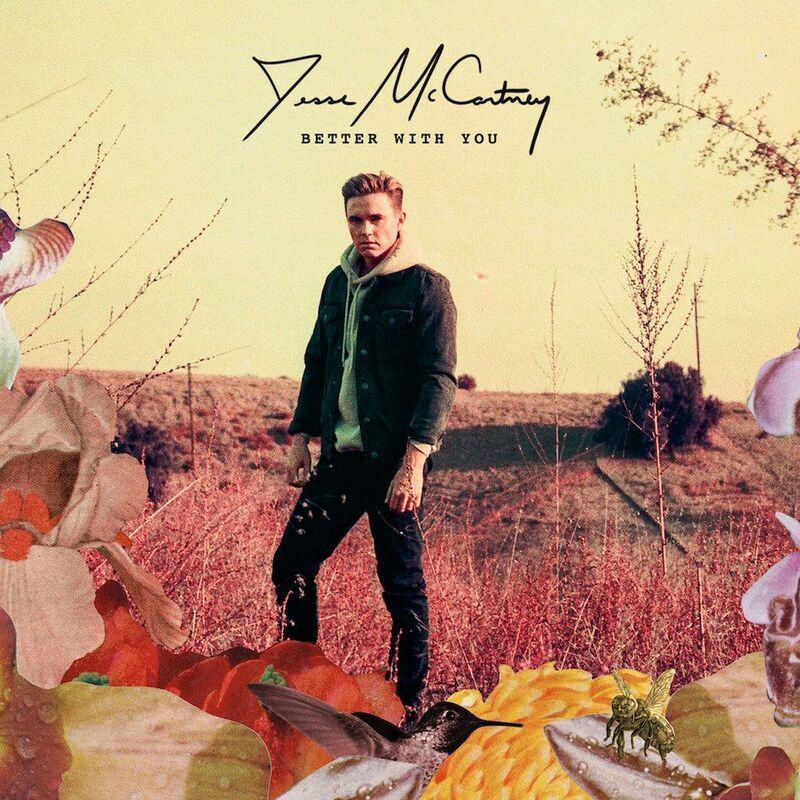 He describes his new single "Better With You" as "a hopeful, uplifting message that was written during a turbulent time socially and politically. The world felt like it was unravelling. I think it was a song that I thought everyone would want to hear and frankly I wanted to hear. So I wrote it." And, one of the biggest changes for McCartney is that many of those tween fans from the early 2000s (myself included) are now adults with perhaps less hormone-driven angst, but new purchasing power and every lyric to Beautiful Soul still memorized. McCartney is ultimately finding the balance between evoking the nostalgia we have for our coming-of-age soundtracks and showcasing his new, culturally-relevant music. Recently, McCartney has been playing at colleges, performing for a lot of people who were raised with his music. The singer has been pleasantly surprised to see that it's not as hard as he had thought it might be to rebuild a fanbase after years away. "It's clear that a lot of fans have grown up with me over the years, particularly because they tell me. I honestly thought that after this much time off, maybe it might be harder to engage with a fan base that hasn't had any new music in a long time. It was pleasantly surprising to see they were super excited. Of course, everyone's growing up. A lot of them are in and just finishing college right now, and I've been doing a ton of college shows in the last year and a half. When you're onstage and you play a song from as far back as 2005, the energy in that room is hard to explain, you just have to be there. It's a rush of excitement for them because it is sort of nostalgic. And then playing the new songs has been really rewarding. I've never in the last 15 years that I've been on a stage, seen a group of people respond so quickly and start singing lyrics to a song they've never heard before." As we talk about McCartney's love of pop music and the rush of excitement it evokes in young listeners, I am reminded of Harry Styles, another charming male pop star with an ardent teen girl following. Recently, Styles made headlines in Rolling Stone for defending the music tastes of teen girls, which have historically been diminished as hysteric and frivolous. I asked McCartney if he had similar views about his fans, and he came back to the idea of passion that he hopes his music evokes and the validity of earnest emotions. "You know what you like. As somebody who loves music, I know what I like to hear and that counts for something" he says. "If a song moves you in any way, whether it's the sugariest of sugar pop songs, then that's a real feeling. That's something that has to be taken seriously. Listen, throughout history we've had many pop idols, many pop singers, and tons of female fans that adore them. That's something that can't be tossed to the side." Stating the validity of taste and emotion may feel gratuitous, but as a female fan who has so often been made to feel like romantic angst is overdramatic and interpersonal dependency is cloying, McCartney's words and music are comforting. Fittingly, with his new single, he shows that we are better because of the people we love and the ways we show that love.